The Duke and Duchess of Cambridge carried out engagements in Scotland today, where they are styled as The Earl and Countess of Strathearn. William and Kate spent last night in Scotland and arrived looking relaxed. Today's appearance marked Kate's first engagement since the royal tour ended last month. It is believed she has been spending time at the couple's country home Anmer Hall, on the Sandringham estate, decorating and making preparations for moving in shortly. According to the Palace, Kate's calendar will be considerably busier during the summer months. William and Kate began the day with a visit to Strathearn Community Campus in Crieff. The fantastic sports and leisure facilities at the campus provide many new sporting opportunities for both school children attending the campus and the wider community of the Strathearn area. The Earl and Countess met local groups including young carers, scouts, cadets and Brownies as well as representatives of Scottish Air Ambulance. 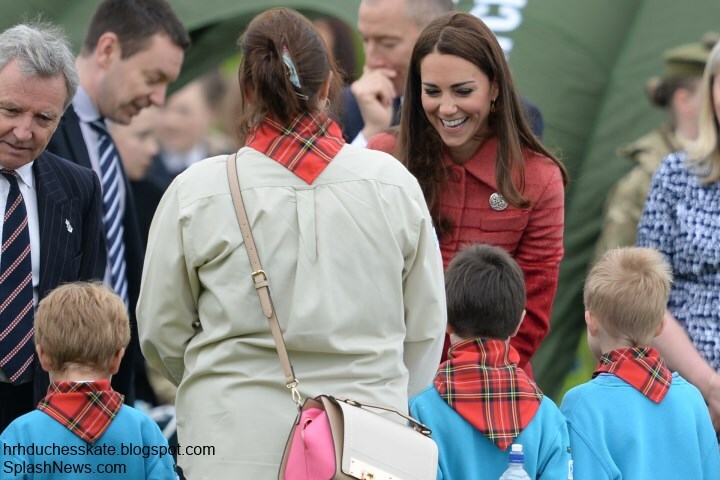 Undoubtedly an interesting event for the couple - Kate has volunteered with the scouts for some time now and it is believed William is considering a career with the Air Ambulance in East Anglia. The couple are expected to visit Scotland again in July for the Order of the Thistle service. 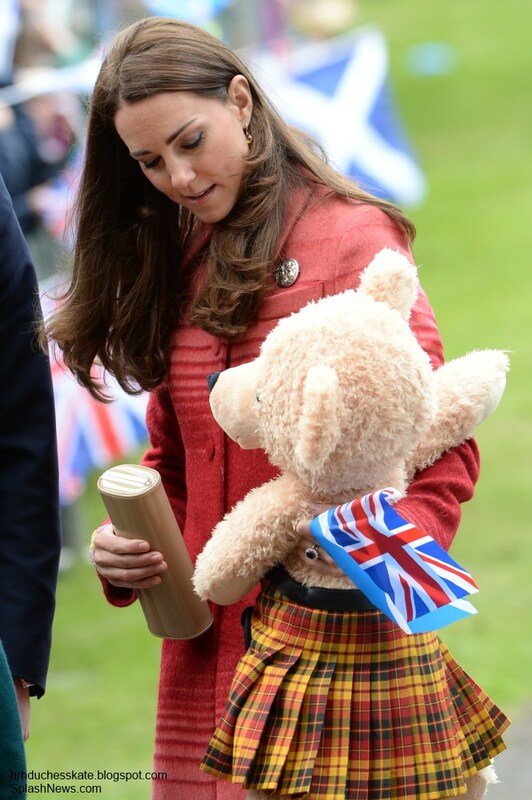 Kate was delighted to receive a large teddy bear sporting a Strathearn kilt. 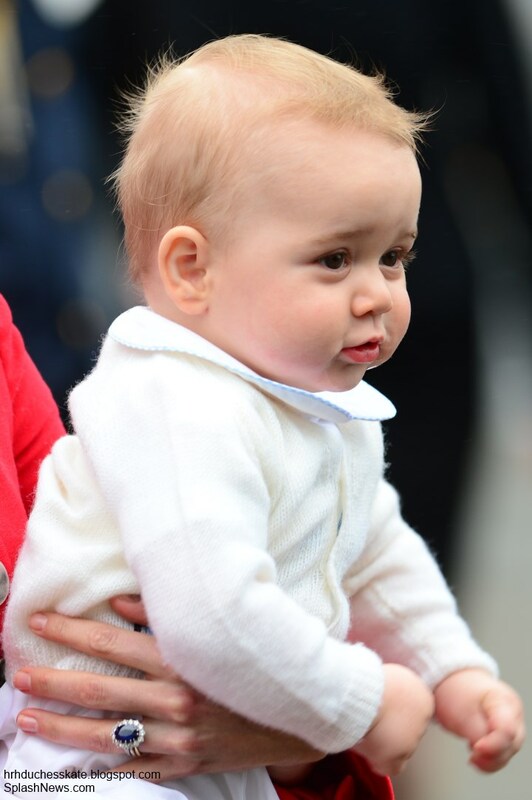 I have a feeling Prince George will be introduced to the adorable teddy. Kate also received a toy corgi for her son. George has become quite the topic of conversation during walkabouts; today Kate revealed he wears Spider-man pyjamas. Even Prince William was eager to have a look at the teddy bear. The couple spent time chatting with locals who were very excited about the royal visit. 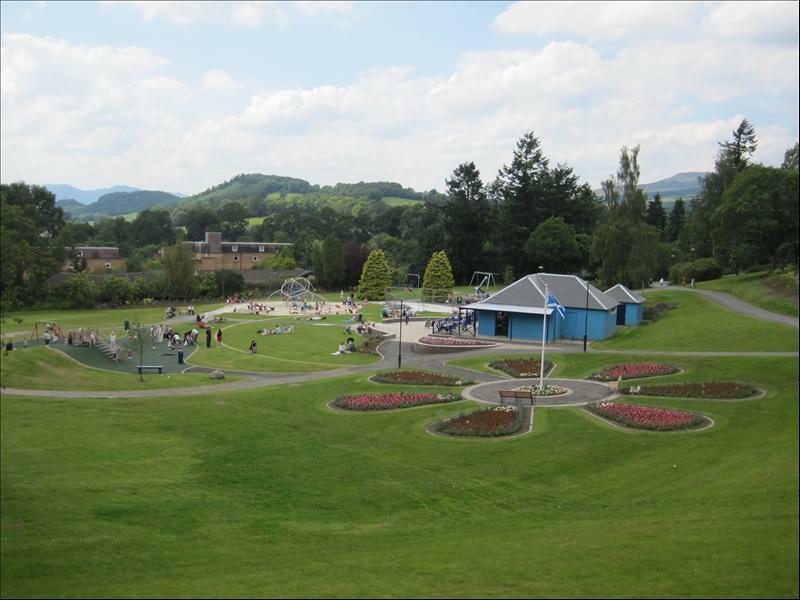 Their Royal Highnesses' next stop was the newly restored MacRosty Park in Crieff. 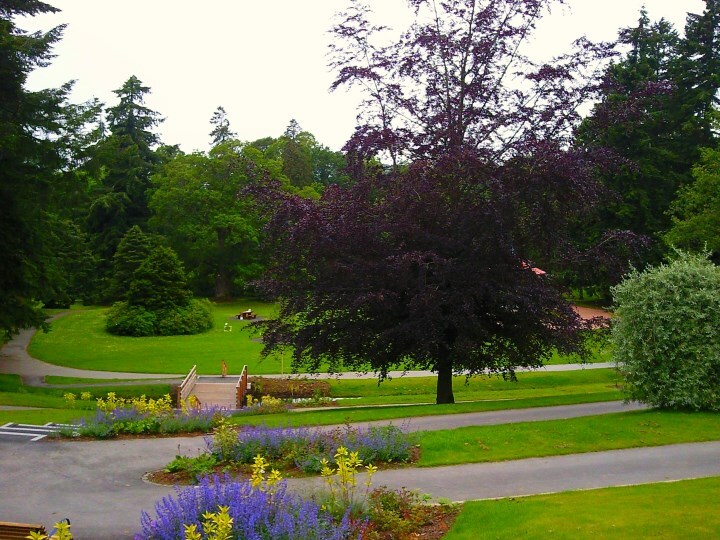 The park has a long history of catering for family visits and has been popular for recreation, play and socialising within a landscape setting of exceptional quality. It has been an integral part of the community for over a 100 years. It's a beautiful place with scenic walkways. The couple unveiled a plaque to mark the dedication of the park as a Field in Trust. Prince William is president of the organisation which works to secure outdoor spaces for sport and play for future generations to enjoy. 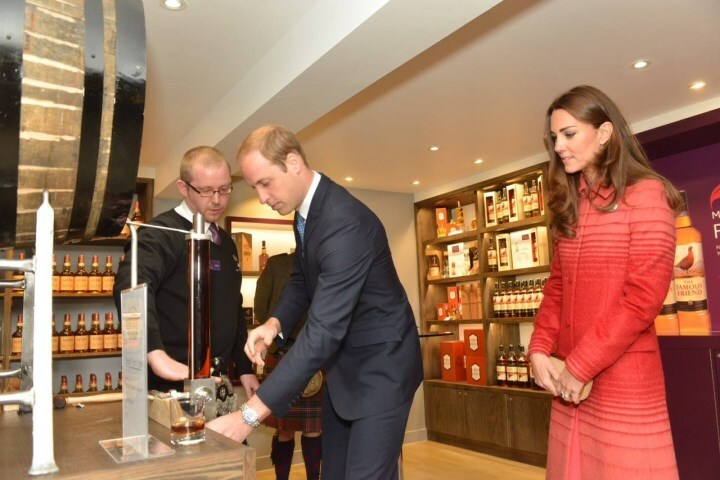 Next, William and Kate visited The Famous Grouse Distillery where they toured the facility. 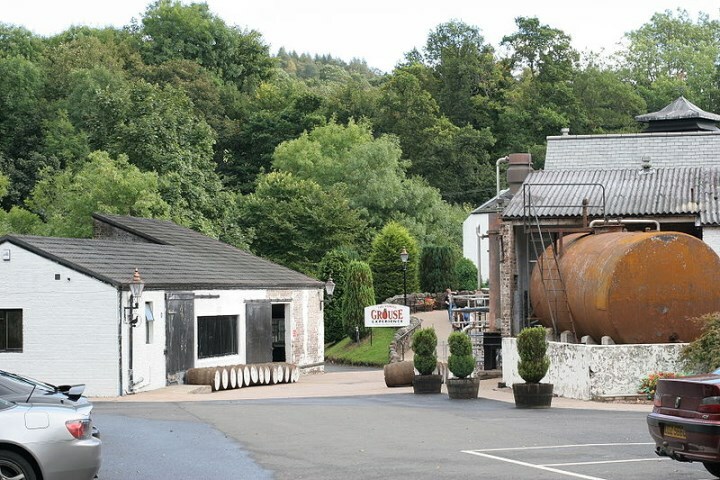 They had the chance to bottle their own Glenturret malt at the country's oldest distillery and to sample Scotland's national drink during their visit. Kate enjoyed a shot of £55 Strathearn heather rose gin and tonic and said, "I'd better not drink too much because of all the whisky I've had at Glenturret". 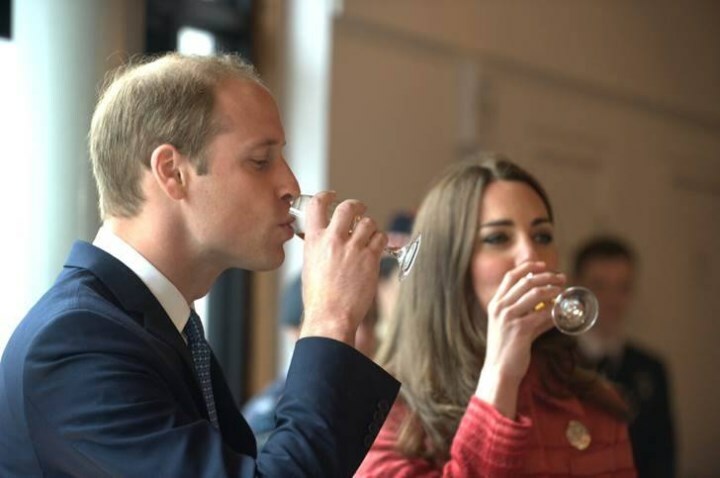 Royal reporters were surprised to see Kate sampling several sips of whisky. This photo should put a stop to those persistent pregnancy rumours for a while. The distillery is located on the banks of the Turret River and was legally established in 1775 to make single malt whisky. It is the most visited distillery in Scotland and its Famous Grouse is enjoyed all over the world. The royals completed their visit by viewing the local Forteviot fete where they saw local produce and met locals. 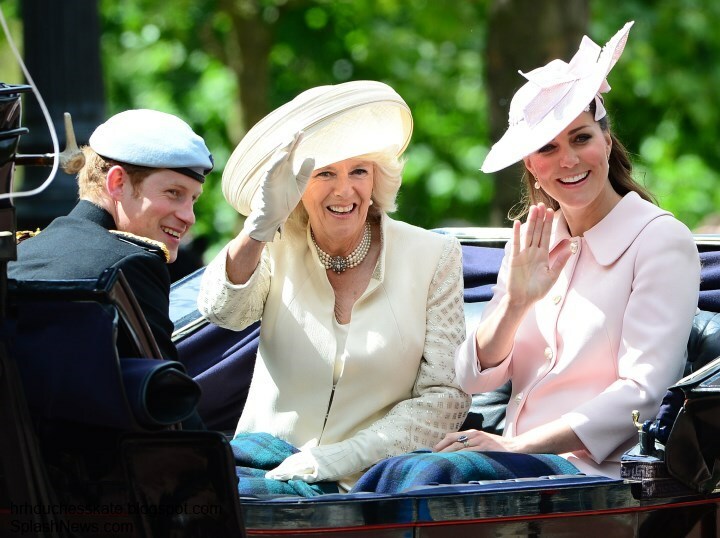 The Duchess looked regal in the Athena Wool Jacquard Coat by Scottish designer Jonathan Saunders. 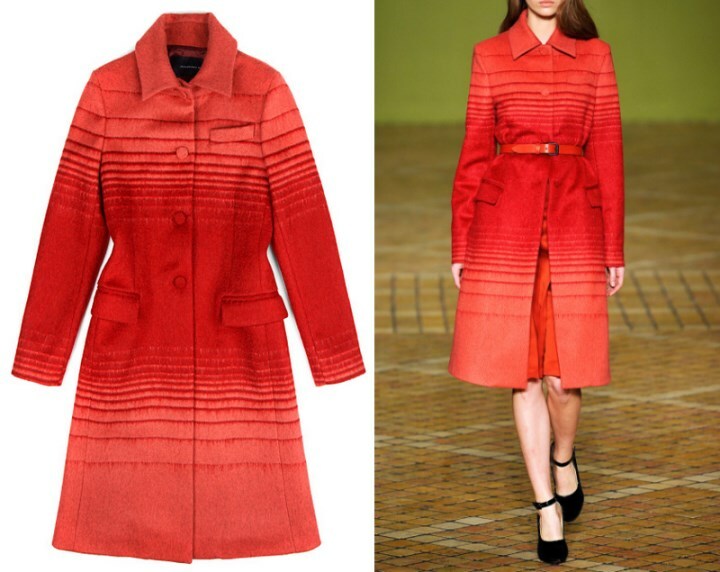 The stripe wool piece is from the Autumn/Winter 2013/2014 Collection and originally retailed for $2,555. It features a notched collar, single-breast pocket, full-length sleeves and flap front pockets. Kate's dress is by Goat, another designer Kate has worn previously. 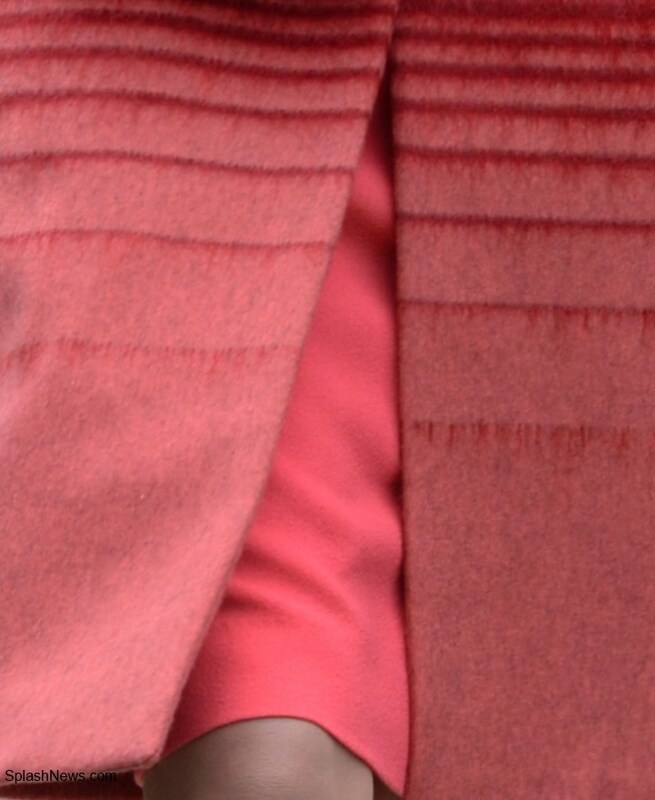 Below we see the dress underneath the Jonathan Saunders coat. There are a number of possibilities for Kate's dress including Goat's Thea Dress. 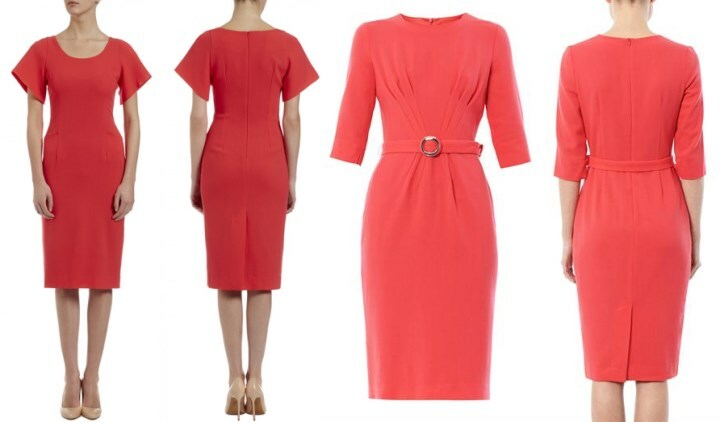 The £420 pencil dress is beautifully cut to fit and flatter, giving you a demure yet modern silhouette. It's fully lined with front pockets and flared angle sleeve. We also look at the designer's stylish Scarlett Pleat-Front Dress. 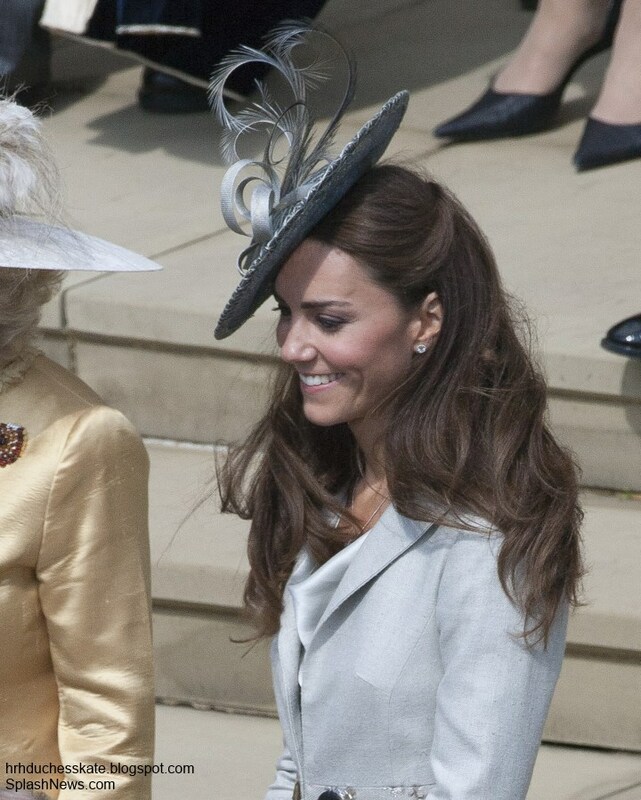 Kate debuted a striking brooch we haven't seen her wear before. The Celtic design piece was a private wedding gift according to the Palace. The Duchess carried her L.K. 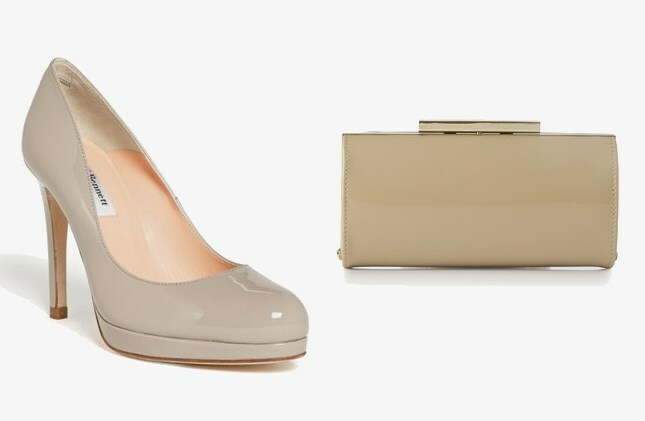 Bennett Avona Clutch and wore her trusty Sledge Pumps. 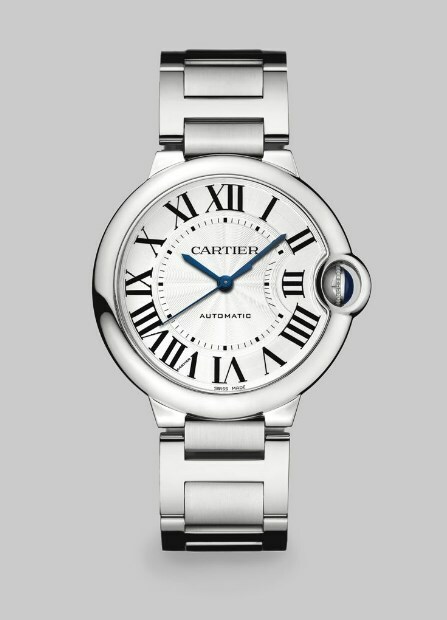 The Duchess wore her Ballon Bleu Cartier watch. 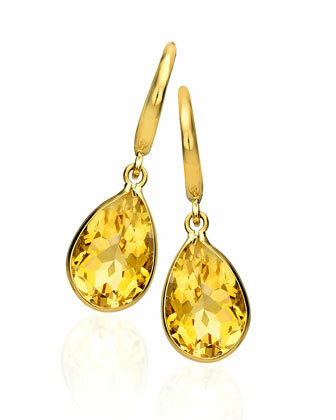 Kate completed the look with her Kiki McDonough Citrine Drop Earrings. This look worked well for Kate on a number of levels. Choosing a Scottish designer was an excellent move and the striped red pattern of the coat appeared to be a nod to Strathearn's tartan. 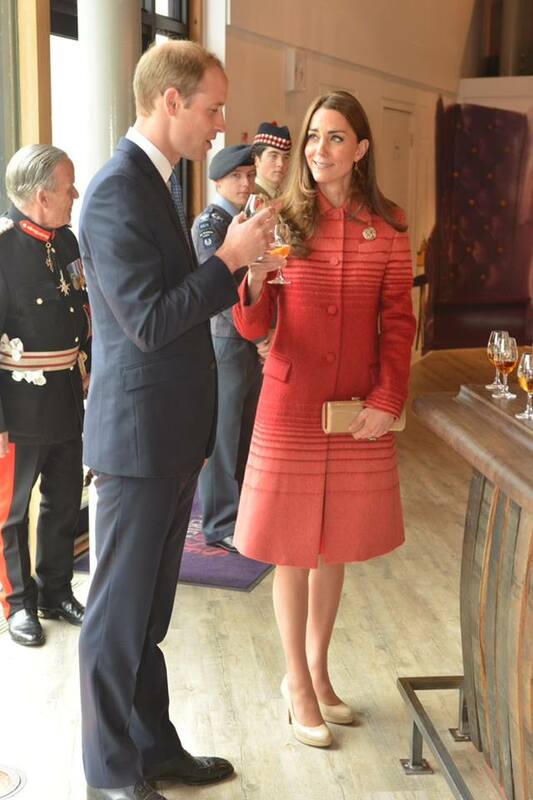 The length of the coat and dress was perfect for Kate and I thought her hair looked lovely; straighter than usual. What did you think of today's look? The BBC video is here. ITN Source has a nice video with good footage from the events. It was a lovely day of engagements for William and Kate. We'll next see them on 6 June when they travel to Normandy to commemorate the 70th anniversary of D-Day. June is one of my favourite months of the year; we finally begin to see summer arriving, exams come to an end, plans for the summer season are firmly underway and for royal watchers it marks one of the busiest months of the year. 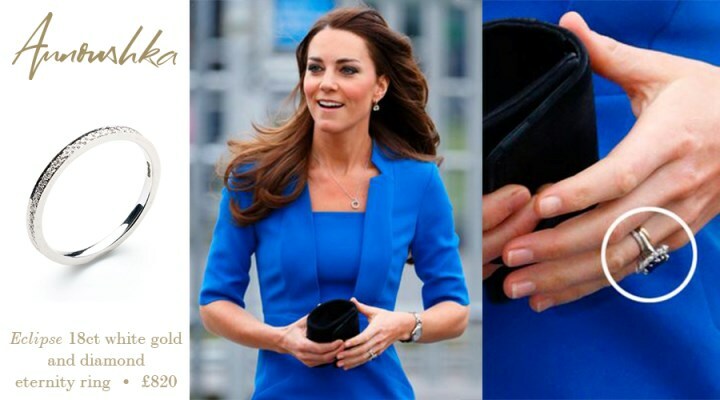 In fact, two new engagements were added to Kate's diary this morning. Let's take a look at Her Royal Highness's June calendar - both confirmed appearances and likely ones. 6th June - As we know, The Duke and Duchess of Cambridge will join senior royals including The Queen, The Duke of Edinburgh, Prince Charles, The Duchess of Cornwall and Prince Harry to commemorate the 70th anniversary of D-Day. William and Kate will meet veterans at a tea party before attending the commemoration of the Normandy landings at Gold Beach. 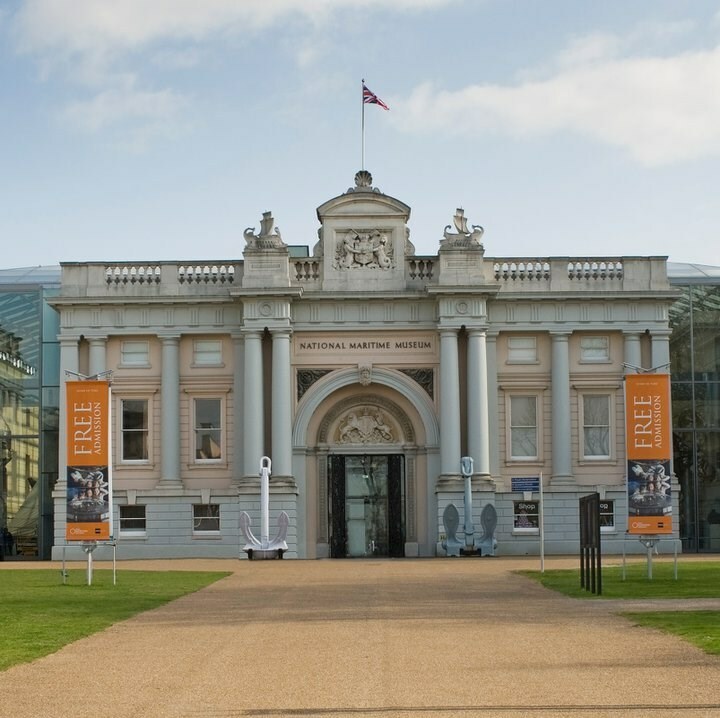 10th June - The Duchess of Cambridge will attend the launch of the America's Cup at the National Maritime Museum in Greenwich. The racing events showcase yachts from all time periods and in the past visitors to the exhibition have had the opportunity to discover the history of the cup since its launch in 1851. Sailing fan Kate showcased her skills in Auckland when she beat her husband twice during boat races. 12th June - Two days later the Duchess will attend a garden party at Buckingham Palace for the 150th anniversary of the Red Cross. The event is one of four garden parties hosted by The Queen each summer; Kate is expected to attend one of these annually and the Red Cross is a wonderful organisation to support. From basic first aid to emergency response appeals in the Balkans and South Sudan, the dedication and work carried out is amazing. The event will mark the third garden party Kate has attended. 14th June - Kate will join the Royal Family for Trooping The Colour, the annual parade which marks The Queen's birthday. It's a fabulous event full of pomp and pageantry. It begins at 10 a.m.
16th June - The Order of the Garter ceremonies take place. 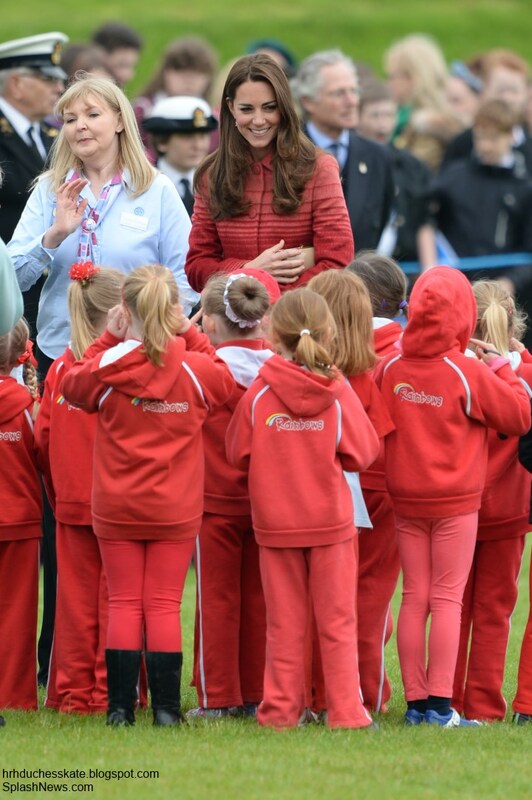 Kate missed this event last year because she was expecting Prince George. I think it very, very likely she'll be in attendance this year. Moving on to possible events where we might see Kate in June. Children's Hospice Week takes place from 13-20 June. As patron of East Anglia's Children's Hospices, Kate is extremely interested in the work carried out by hospices around the UK and in supporting them by raising awareness. 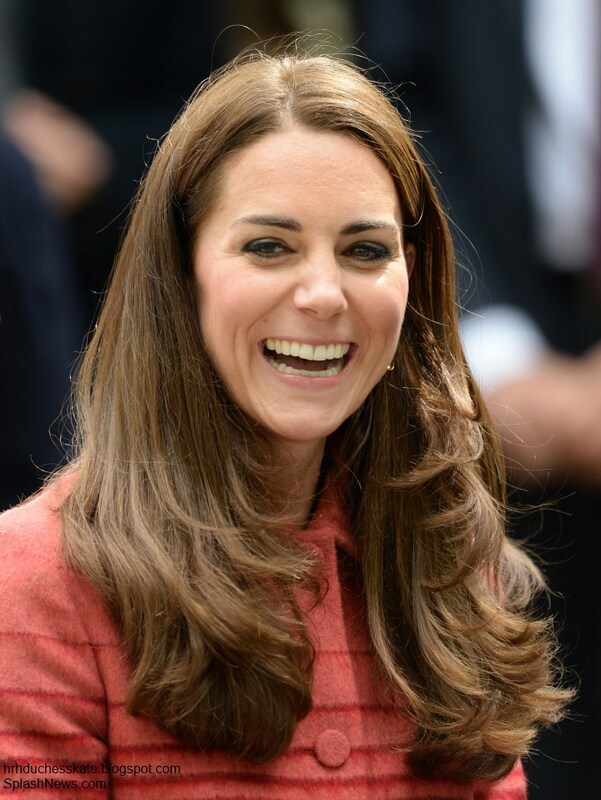 Last year Kate recorded her first video message and visited Naomi House to mark the week. I expect we'll see an engagement or two to mark the week again this year. Undoubtedly William will participate in polo matches during June (the Cartier Queen's Cup takes place on 15 June). 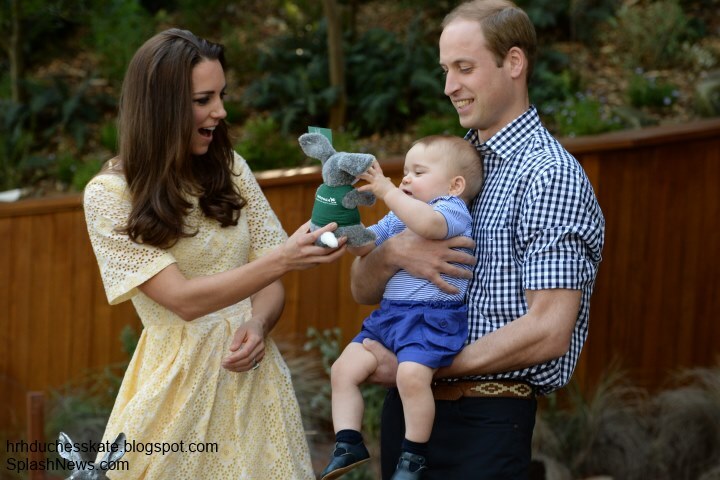 Perhaps Kate, George and Lupo will go along to cheer him on at a match or two? Wimbledon kicks off on 23rd June and tennis fan Kate won't want to miss seeing British number one Andy Murray attempt to take the title for the second consecutive year. 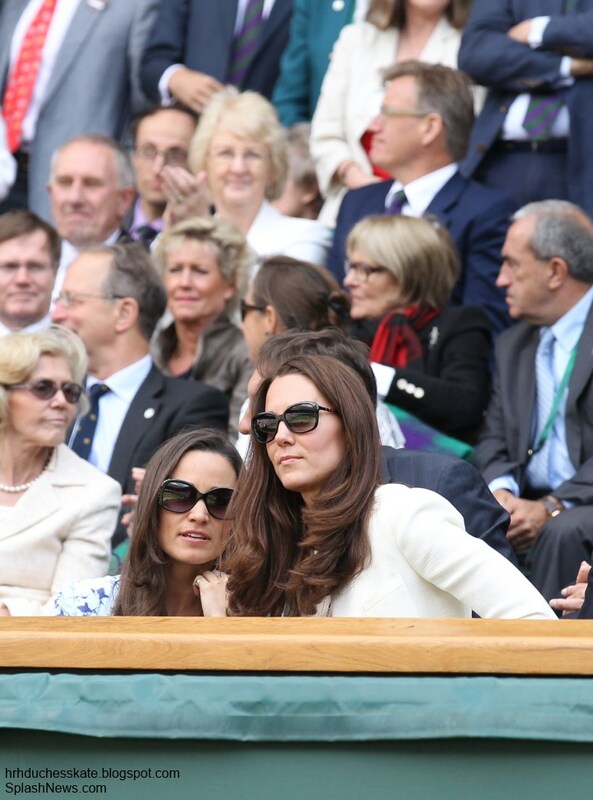 There has been much talk regarding the possibility Kate may become a Wimbledon ambassador in the near future. The Palace said there would be "a significant upsurge" in royal duties for the summer, so we can expect to see plenty of Kate in the coming months. In my opinion, it is unlikely William and Kate will be taking on a full-time schedule of royal duties in the foreseeable future, so a role with the East Anglican Air Ambulance Service would permit William to return to his love of flying and allow the family to be away from the public glare in London. In terms of public perception it may not be considered the best move, as it was thought the Prince would take up more royal duties or a role in government which would serve him well in later life. Interestingly, royal correspondents discussed this with aides and were given the impression this was unlikely, however, communication between the Palace and the press has not been at its best, shall we say, since Kensington Palace and Buckingham Palace merged their press offices. We'll know William's decision officially in the coming months. Finally, as you all know German tabloid Bild published photos of Kate's dress flying up as she prepared to board a helicopter en route to the Blue Mountains. The intrusive snaps were reportedly taken by a woman who sold them to the highest bidder. They show Kate's buttocks and the incident has caused quite the furore in the press and amongst royal fans. Many were disgusted that these invasive photos were published whilst others feel it could have been avoided if Kate had chosen different clothing. As a woman, I find the popularity of publishing such photos abhorrent, but in this age of Internet media and a desperation for readers, it's sadly not going to change any time soon. For Kate's sake, I do strongly feel she should consider alternative clothing. Be it trousers, pencil skirts, weighting her dresses or choosing different undergarments. It shouldn't be necessary of course, but for one of the most famous women in the world it's very much a necessity. The Palace has not made an official comment on the matter. Please feel free to continue your debate on the topic in the comments section. With almost 8,500 votes, the coat poll proved to be our most popular from the tour, but there was one clear winner from very early on - the bespoke dove grey Alexander McQueen coat Kate wore on Easter Sunday for a church service - and upon reflection it's easy to see why it proved so popular. 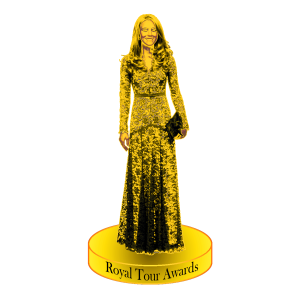 It was a very elegant, fitted, regal piece befitting a future queen. We all fell in love with Kate's L.K. Bennett Lasa Poppy Print Dress and it comes as no surprise you voted for it as your favourite dress from the tour. The £245 sheath dress was the first high street dress the Duchess wore during the tour, and the popularity of the piece is a testament to just how far brands such as L.K. Bennett have come in terms of competing with designers. Kate's pale pink Alexander McQueen peplum top and pleated skirt wins this one. Once again we see the collaboration between Her Royal Highness and Sarah Burton working well. In terms of casual looks, Kate's outfits were quite similar which explains the fact that this was our closest poll, however, Kate's appearance at a rugby match in Sydney is our winner. It was a great look, casual and comfortable with the addition of the chic Beulah London Eden Scarf. 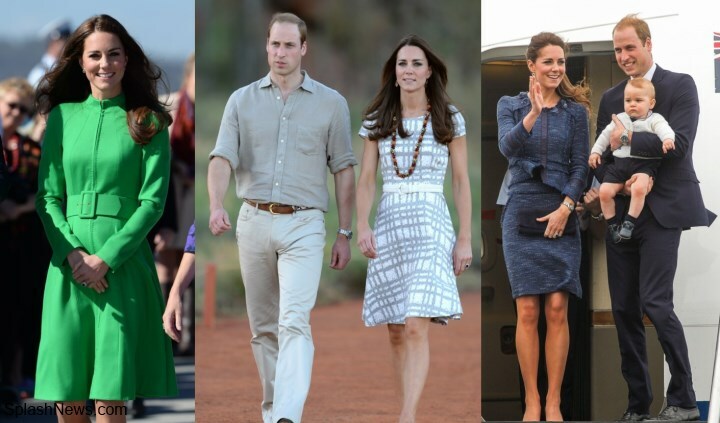 I thought it interesting to share the least popular sartorial pieces Kate wore during the tour, too. The vivid green Catherine Walker coat was an obvious one for me. The moment I saw it, I instantly thought it didn't work well for the Duchess (in fact, I cannot think of anyone it would work for). We also have the Hobbs Wessex Dress and the Rebecca Taylor tweed suit - most likely considered underwhelming pieces because they were repeats. The Jane Taylor hat Kate wore on Easter Sunday wins our best hat award. I was very interested to see the results for our very first poll about Kate's hairstyles. Once again, the Easter Sunday look is our voters' favourite. The intricate do was beautiful; Amanda Cook-Tucker outdid herself with this one. This entire look was a resounding success, perhaps because it's rather understated yet classic. 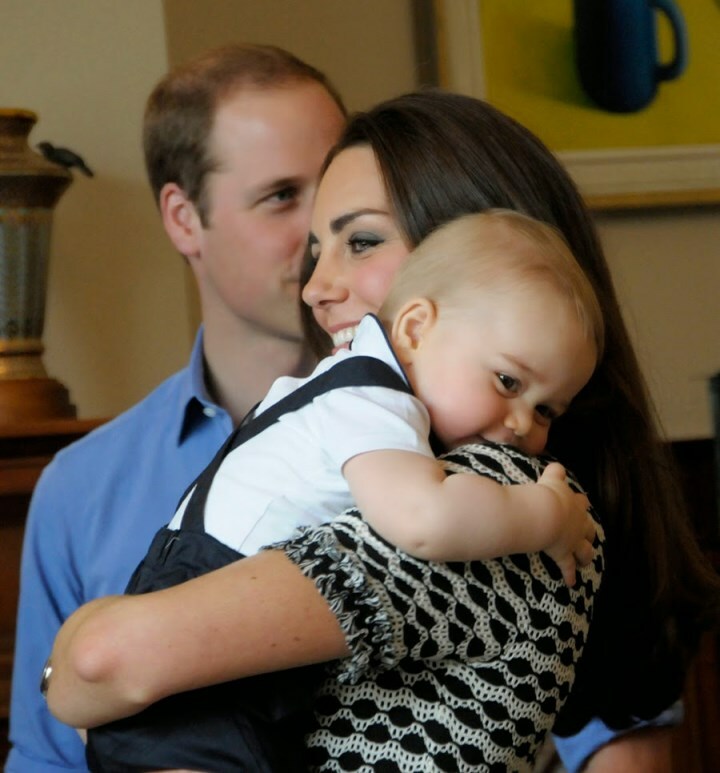 Photographer Simon Woolf captured a very special family moment during a playdate at Government House when George was leaning on his mother's shoulder. It's Kate's favourite photo of the tour and was voted as yours, too. 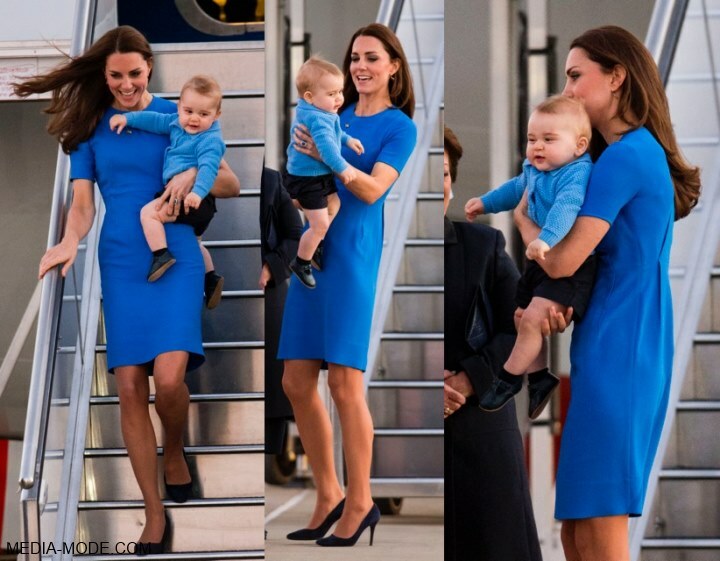 George's departure outfit in Australia really was terribly cute. The red and white stripe dungarees by Neck and Neck and the bright red cardigan: ADORABLE! The little Prince displayed a delightful array of expressions during the tour, and it really was impossible to choose. I know I couldn't and several readers shared the same dilemma. They're all equally cute but George's pout is our winner. With many thanks to everyone who voted and commented. These polls have been such fun! Did your choices win? Are you surprised by any of the winners? 'On 6 June, The Duke and Duchess of Cambridge will meet veterans at a tea party in the town of Arromanches before attending the commemoration of the Normandy Landings at Gold Beach (Arromanches). Our next update concerns Kate's much talked about eternity band. The wonderful Anna (who runs a splendid blog on The Countess of Wessex) successfully identified it as the Eclipse Diamond Eternity Ring by Annoushka. The Zimmermann Roamer Day Dress is now available for pre-order at Austique for £410. 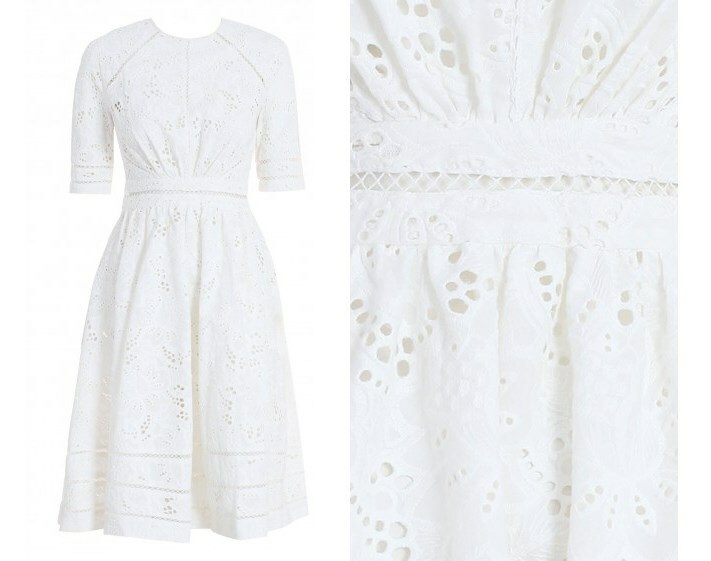 The intricate broderie anglaise eyelet detailing on the ivory cotton makes this a feminine and eye-catching piece perfect for the summer season. We expect it shall become available in stores and on other websites in the coming weeks. 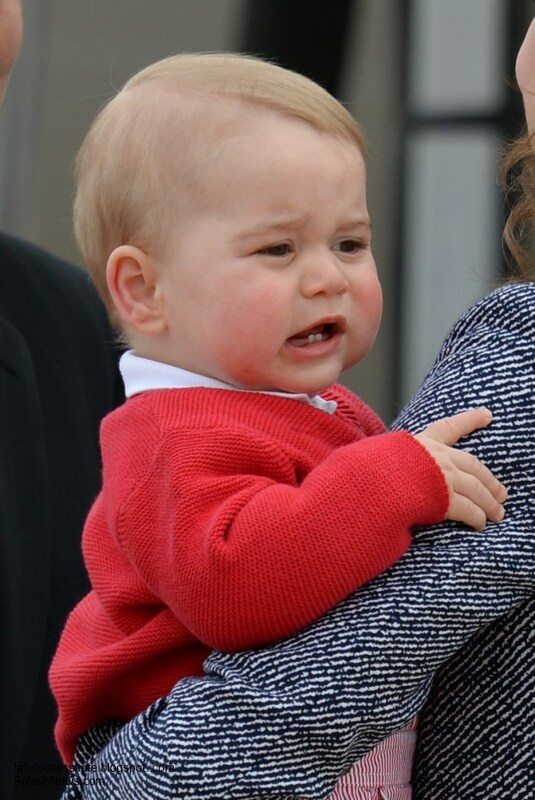 We're back with our final polls and as requested they're all about Prince George. 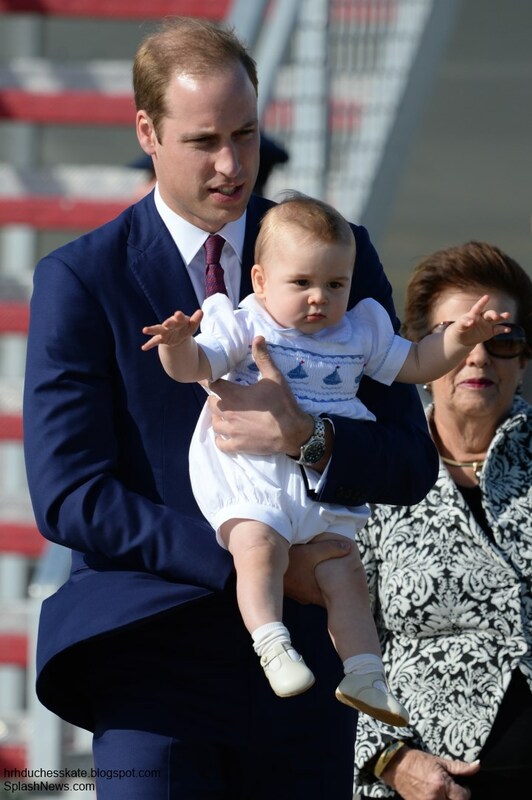 The adorable tot stole hearts all over the world during the Cambridges' tour down under and took centre stage wherever he went. We begin by asking you to vote for the Best Family Photo taken during the tour (it's been thoroughly enjoyable whittling these down). For this poll, we've chosen more personal photos rather than airport departures and arrivals. Prepare yourselves for some serious cuteness. Our first choice is Kate's favourite photo from the tour. At Prince George's first official engagement - a playdate at Government House - photographer Simon Woolf snapped a beautiful photo of George resting his head on Kate's shoulder with William standing beside them. Mr. Woolf gave the Duchess a black and white copy which we're sure she'll treasure. Our second option is also from the playdate. 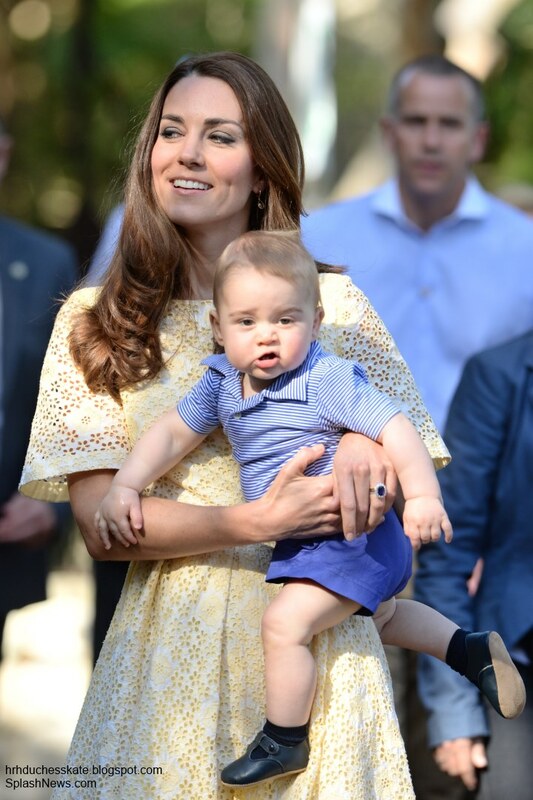 The trio's visit to Taronga Zoo in Sydney was perhaps the most memorable in terms of seeing Prince George. 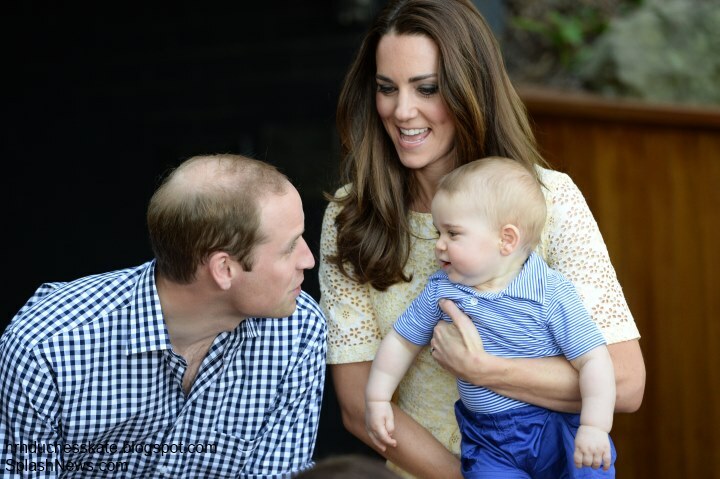 This one offers a lovely opportunity to see William interacting with his son. 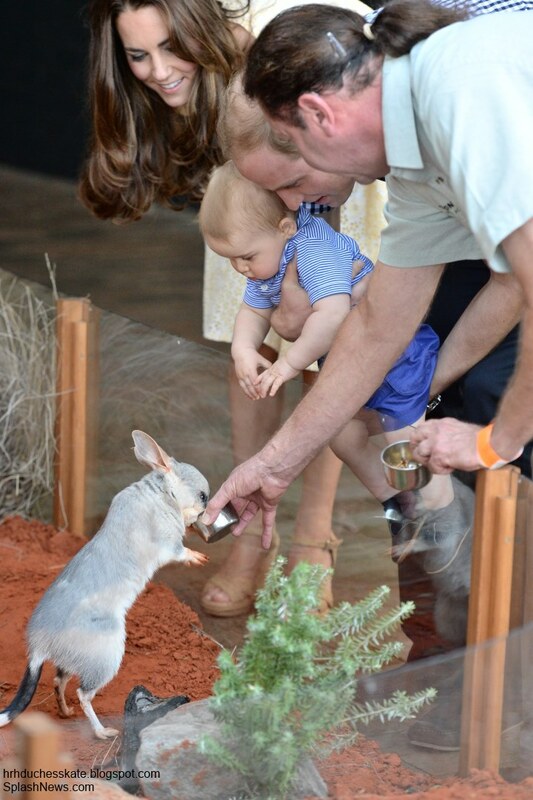 William and Kate enjoyed introducing their son to a bilby. 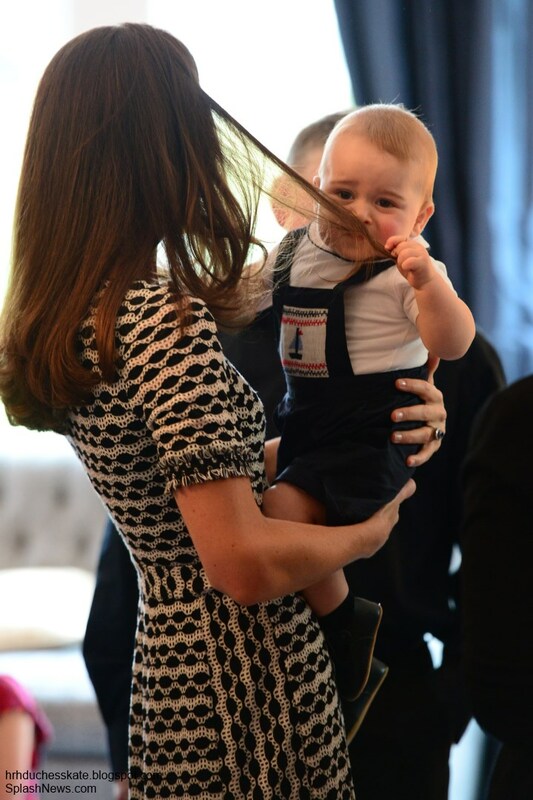 In fact, George was very eager; so much so that William said, "he's trying to grab his ear" to which Kate replied, "If he gets it he'll never let go". Next, another photo form Taronga Zoo (one could easily add ten from the zoo). George was very pleased to receive a toy bilby but quickly threw it away much to the delight of those at the scene. No George would have preferred the real thing! Our final option is one there was much debate about including, but following requests via social media we elected to add it to our poll. 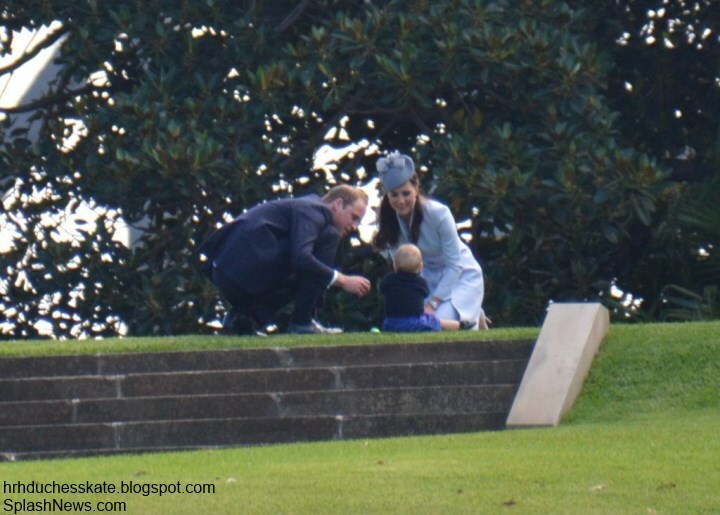 After the Easter Sunday service, the Duke and Duchess returned to Admiralty House to play with their son. I quite liked the fact that although Kate was wearing custom McQueen she knelt down in the grass to play with her son. It's a great shame an informal photo-call like this wasn't a part of the itinerary. We wish to note the Palace did not complain about these photos. Vote for Best Family Photo! Moving on to our second poll: Vote for George's Cutest Tour Outfit! We've all heard of the Kate effect, but we saw the 'Prince George Effect' in full force during the tour, such was the interest in the prince's wardrobe. 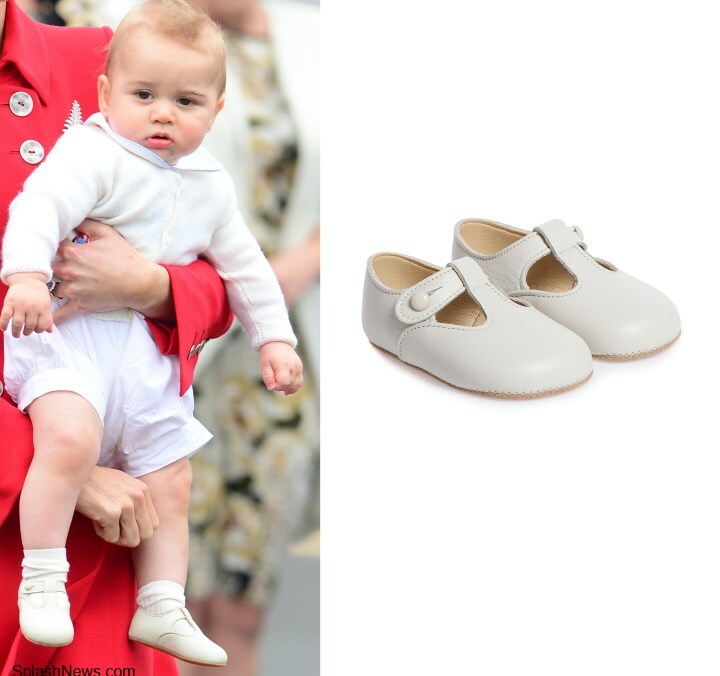 For their arrival in Wellington, New Zealand, George looked adorable in cream and white with his Early Days Ivory Pre-Walker Shoes. 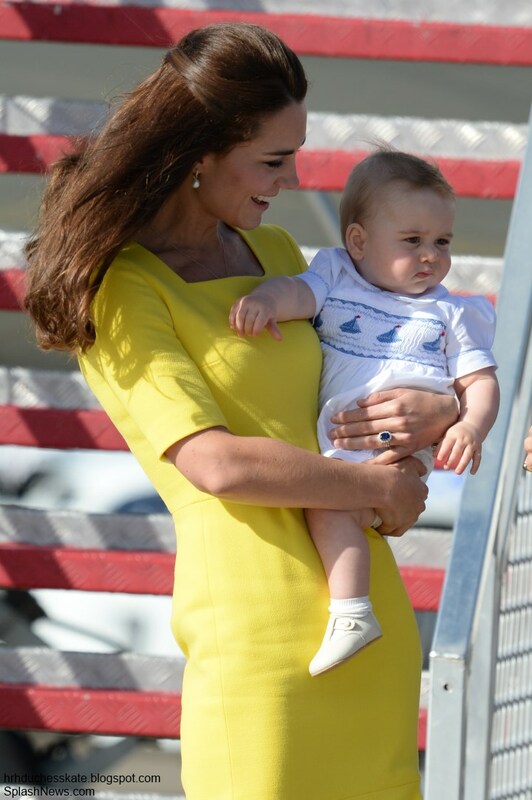 For his first official engagement, the little prince looked darling in the Rachel Riley Sailboat Smocked Dungarees. The navy and ivory cotton dungarees retail for $129 and feature an elasticated waist and adjustable straps which cross over at the back (oh, the cuteness factor!). George also wore the £15 Trotters Milo Body and a pair of £25.99 Early Days Pre-Walkers. 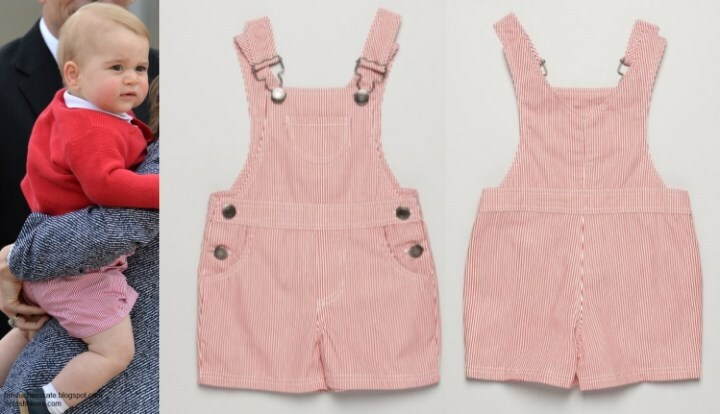 A very sleepy Prince George departed Wellington, New Zealand with his parents on 16 April looking adorable in his Rachel Riley Dungarees, Trotters Onesie, Early Days Pre-Walkers Shoes and an ivory cardigan. 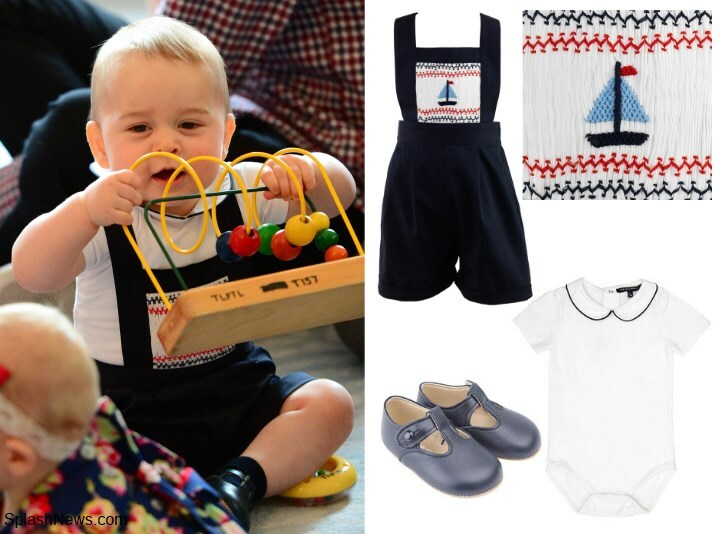 Prince George looked very cute in a white romper with sailing boats by Les Petites Abeilles for the royal arrival in Sydney. The hand smocked and embroidered design retails for £60. For his arrival in Canberra, Prince George wore the Rachel Riley Moss Stitch Cardigan. The $89 dark sky blue cardigan is 100% cotton with pockets. George looked excited for his zoo visit in the Rachel Riley Striped Jersey Polo and the navy Pocket Shorts. They're available for $69 and $89 respectively. The prince also wore his Early Days Alex Shoes. 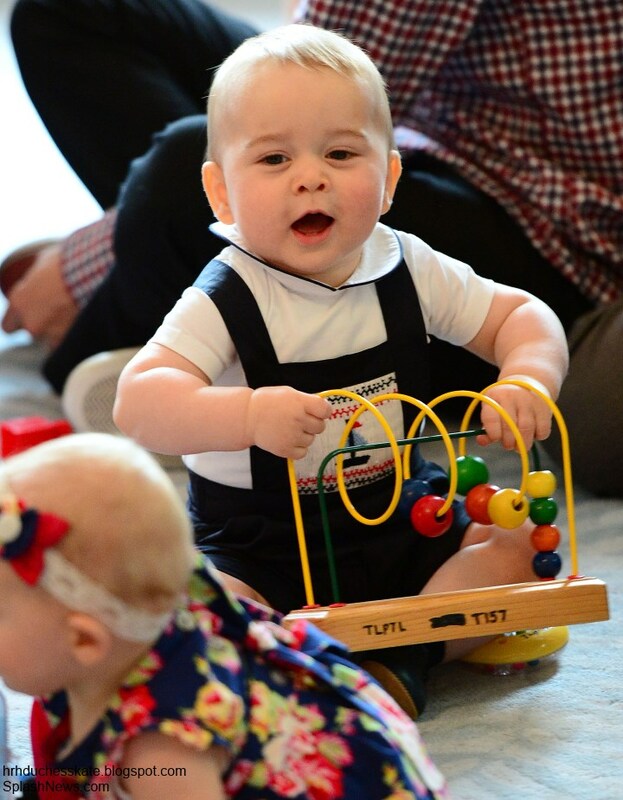 Prince George was gorgeous in a red cardigan and white and red stripe dungarees by Neck and Neck and his Early Days Pre-Walkers as he joined his parents to depart Australia. Vote for George's Cutest Tour Outfit! 2. The 'Mom I love your hair'. Vote for George's Best Expression! In other news, it's been incredibly quiet on the royal front. According to various reports, it seems the Duchess has been spending quite a lot of time working on completing the interior of the couple's new country home Anmer Hall. The Queen's first garden party of the year takes place today. It's the first of four that will take place over the season. We know Kate will attend one, but will it be today's or one at a later date?